New Mexico is well known for outdoor sports like skiing and hiking, but its indoor activities are also abundant, endorphin-rich, and spiked with local flavor. At one point early in our lives, we didn’t see movement as exercise. Our supple joints ratcheted us along on monkey bars, we did somersaults off diving boards. Exercise was a byproduct of play. Jeering discouragements, beady-eyed gym teachers, and self-inflicted comparisons to shockingly gifted peers hadn’t yet discouraged us into inactivity, or just plain turned movement into a chore. I was active in high school, but over the decades, my fitful attempts at running, yoga classes, and exercise videos never did stick. In my mid-30s, I came dangerously close to the conclusion that I just wasn’t one of those people who could sustain a workout program. It would take a lot for me to bound, puppylike and tail wagging, into a new exercise community. Then, a friend needed a new focus to get over some personal problems, and it was decided that we, her friends, should scout around for good classes. I went to a Nia class, not really knowing what it was. Experientially, it seemed like a lot of fun dancing around with a mix of structure and improvisation. I can still remember the feel of the wooden floorboards under my bare feet, my gravitation toward the back of the room, my happy surprise as Annie Lennox’s familiar songs filled the space. I would later learn that Nia is formally described as a movement program that seamlessly intermingles dance, healing arts, and martial arts (learn more at nianow.com). Getting the steps, which had their own pattern, their own intelligence, felt triumphant, and when I wasn’t perfect—when I went left as everyone went right—classmates seemed tacitly, warmly understanding, if they even noticed. In the mirror, I watched my hips follow the teacher’s into figure-8 movements, my arms execute fierce Hi-yah! tae kwon do chops. It was the breathless fun of childhood neighborhood play that slipped away from me one adolescent afternoon, now regained and coupled with exercise that has a solidly athletic architecture. During the course of one class, I might find myself skipping, jumping, spinning, galloping, playing air guitar, and rolling around on the floor. Was it a preschool playground? It often resembled one, right before it shifted into the tight, synchronized choreography reminiscent of “A Chorus Line” or a Janet Jackson video. I noticed changes as the weeks went by, reminiscent of those I often saw in new students of yoga. My lifelong slumpy posture corrected, as I felt the crown of my head rise as if a string were exerting a gentle tug. My shoulders unlocked. My feet stabilized my whole body, each toe engaged. Pounds dropped off, and my entire body snapped back into place after the various sags wrought by two pregnancies and years of sitting at a desk. Once I’d become familiar with Nia, I wanted to experience it in different Santa Fe venues. I walked into StudioNia in the beginning of 2011, drawn by its “7 Days for $7” offer. The space had all the physical expansiveness of a loft, but was also very cozy. The teacher, Holly Nastasi, greeted me and sussed out my experience level. She made me feel welcome, empowered to take the class on my own terms. The music began, and it was Annie Lennox once more. It felt like a sign. Each subsequent class was a journey that brought me to my outer limits of exertion, flexibility, and coordination. I left damp and grinning, a happy, sweaty mammal. My brain felt sharp, as if it, too, had been warmed up. A morning Nia class increased the odds that I’d spend the day in good spirits, dispatching work and personal challenges with equanimity. I appreciated New Mexico’s brand of Nia even more after taking classes while traveling. San Francisco found me in a community-center studio, the room encroached on by various exercise paraphernalia. The beauty of Palos Verdes was entirely hidden from us in a windowless dogleg of a basement studio interrupted by pillars. Brooklyn’s class was in a narrow, fusty brownstone, with no room to leap like a gazelle if the spirit beckoned. The same qualities that make New Mexico a Nia nexus—the embrace of alternative healing practices; deep awareness of the connection of body, mind, and spirit; its free-spirited lack of inhibitions, and willingness to try new things—also make the state a hotbed of other exercise studio modalities: yoga, Zumba, and even something called piloxing, the love child of Pilates and boxing. New Mexico has long been known as a destination for yoga travelers, who select à la carte retreat experiences from our plethora of classes, meditation centers, spas, and natural-food restaurants. It’s also home to some of the top Nia teachers in the world. Their trainings regularly summon people who choose to learn here instead of in other American cities, glorying in the amazing food, culture, art, and geography (not to mention rich shopping opportunities—see “Shifting Threads”). I think quality exercise classes are plentiful here because New Mexicans, in addition to being different in many other ways, don’t really work out the way the rest of the country does. We don’t want others to eat our dust, we’re not into preening and posturing. We aren’t starving ourselves into a socially acceptable size zero. We’re not about feeling the burn. We just make sure that we schedule in good sweaty fun, because otherwise, like kids and puppies, grown-ups get grumpy, have meltdowns, and end up chewing things we shouldn’t. Here’s a selection of great spaces, practices, and teachers to seek out—whether want to check out the world-famous teacher down the street, are aiming to maintain your practice while on vacation, or like to fold fitness into your in-state travels. Nia in Santa Fe Kelle Rae Oien, program director at StudioNia Santa Fe, is one of the top trainers in the world—in fact, she single-handedly introduced the movement form to Brazil. To watch her teach is to wonder if gravity really does apply to her sprite-like body—but her huge grin and inspiring, inclusive presence lead students to similar heights. (Oien also leads a popular Saturday-morning class at Body.) StudioNia’s strong array of teachers and classes (early mornings, evenings, and any time in between) is unrivaled in the rest of the state, and in much of the country. Beginners will appreciate the slightly more mellow pace of Sarah Mitchell’s and Jamie Berry Klein’s classes. (505) 989-1299; studioniasantafe.com. Yoginis the world over flock to Santa Fe for retreats, teacher trainings, and to experience different teachers, types, and venues. Whether you’re a Bikram (hot) yoga aficionado, or prefer Anusara, there are studios devoted to those types alone. “Yoga Source is great if you’re completely committed to mind-blowing, intense Astanga,” says software developer Dimitri Wolf (505-982-0990; yogasource-santafe.com). Body’s Sunday noontime Gospel Vinyasa is the brainchild of Josh Schrei. “The purpose of yoga is to connect the individual to something larger, to the divine energy of this universe. Gospel music serves the same purpose, so to me the two seemed like a perfect fit.” (505-986-0362; bodyofsantafe.com) Schrei and colleague Emily Branden alternate teaching Body’s convenient noontime vinyasa classes on weekdays. 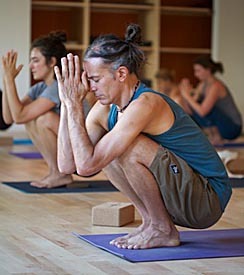 Santa Fe Community Yoga Center offers numerous classes, many for only $5 (505-820-9363; santafecommunityyoga.org). Spandarama, an Anusara yoga studio owned by warm, encouraging teacher Wendy Borger, is a light-filled space that includes Rasa, a delicious raw-foods café (505-989-1288; spandaramayoga.com). 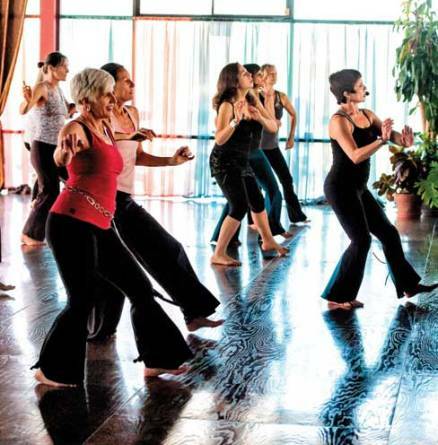 Life’s too short—and the offerings are too rich—to settle for mediocre Zumba in the Latin-dance-centric Duke City. Follow the locals to one of Clarissa Sandoval’s three weekly class at Defined Fitness San Mateo. Actually, get there way before them. “I have to sign up at least a half hour early to get in,” says mother of three Katie Edwards. “It’s packed. She has an absolute following.” What makes Sandoval’s classes different? “She customizes the choreography, adds more movements. It’s not too complicated, but complicated enough to be fun. Plus, she has a great personality. She’s so cute, bubbly, encouraging, and energetic.” (505-888-7097; defined.com/sanmateo) Sabrina Samudio-Ruiz, another popular teacher, leads students at Studio Sway and Maple Street Dance Space (sabrinas.zumba.com). See "Shifting Threads" for exercise wear shops and lines to explore. Candace Walsh is the managing editor of New Mexico Magazine and the author of Licking the Spoon: A Memoir of Food, Family, and Identity (Seal Press, 2012).